The last time I made duck sausage, I turned the trimmed leg bones into a big batch of phở broth, using a recipe I adapted from Into the Vietnamese Kitchen. , I had a few legs left over, so why not make duck phở? I thawed out two quarts of the broth and simmered three duck legs in it for about two hours. I removed the legs and let them cool while I skimmed excess fat off the broth, then pulled the meat off the bones. 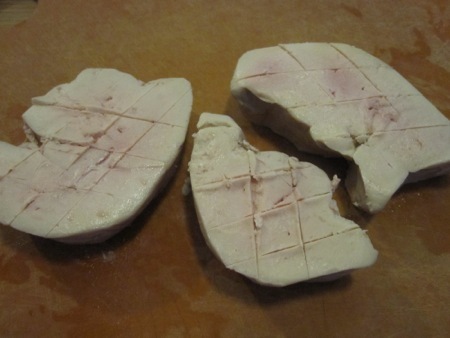 I sliced a red onion, boiled some thin rice noodles, and then scored three small chunks of foie gras (only a few bucks each). 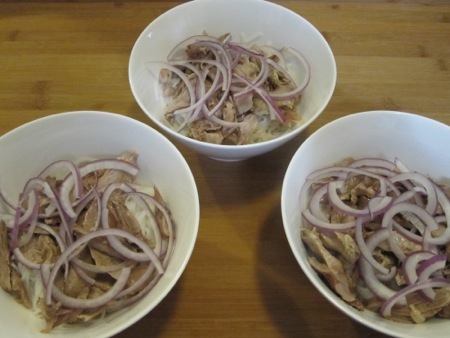 I divided the noodles into bowls, then added the duck meat and onion. 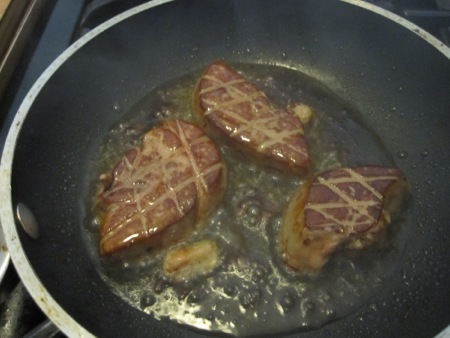 Although this was my first time using foie gras as an ingredient, I’d eaten enough of the stuff to know that it needs a quick, hot sear. I ladled hot broth into the bowls, added the seared foie to each, and garnished with mint leaves (closer in taste to the unavailable Thai basil than Italian basil). I served the phở with the traditional accompaniments of bean sprouts, limes, hoisin, and sriracha. This was a tasty bowl of soup, just as rich as the more traditional phở dac biet (beef phở). Chewy bits of duck meat, soft foie, crunchy onions – all the textures were there, along with the highly aromatic broth. 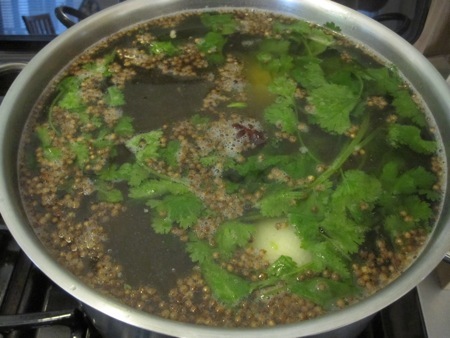 Once you have the broth (and you do keep a stock pot on the stove al the time, don’t you? ), the rest of the dish comes together in two lazy hours, which includes the time while the legs simmer. 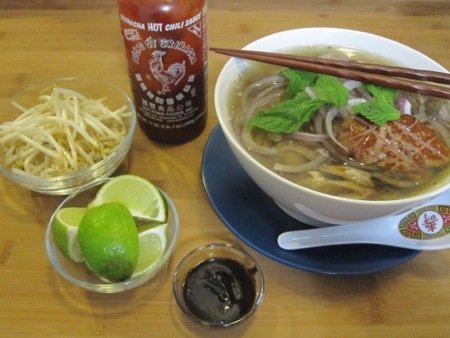 Do yourself a favor this winter – instead of plain old soup, treat yourself to some phở. I was looking for some stock to make a batch of red beans and rice, and I discovered a quart of smoked turkey stock in the Deep Storage Facility. I couldn’t remember why I had it, then it occurred to me that I had made it from the carcass of the tandoori turkey. I might try that treatment with a whole duck or two, but our Thanksgiving turkey will be more traditionally prepared. And don’t get me started on stuffing; I’ve had to revise the non-alignent pact between me and She Who Must Be Obeyed in order to defuse any religious wars. I hear you. Speaking of which, do you need more tandoori masala? I’m going to have to make a run to Dallas Spice Market to pick up more, and they’re almost literally down the street from me.